This week at ODBD, The Challenge Team thought it would be fun to make it a nontraditional card or project using different folds or shapes that are NOT your typical A4 or A2 or rectangular cards. These can be accordian fold, shadow box, circles, hearts, trifolds, easels, pocket cards, gatefolds, multifolds, wiper, sliders, etc...as long as it's outside of the box/norm! There are many tutorials for different styles of cards that can be found in the Resource Section of Splitcoast Stampers here. To make this more fun, ODBD will be giving a $15 gift certificate toward stamps at the Our Daily Bread Designs store!! Entries for the prize must be submitted by Thursday, March 4. A random winner will be chosen & announced next Saturday. While it's not required to use ODBD images/sentiments, we love to see 'em if you have 'em. As a way of recognizing those who do use Our Daily Bread Designs stamps, we will again be choosing 1 to 2 creations to spotlight for our Shining the Light Award at ODBD. In order to qualify for this award, however, you must use Our Daily Bread stamps and have your submission added to Mr. Linky by March 4 at 8 p.m. EST. 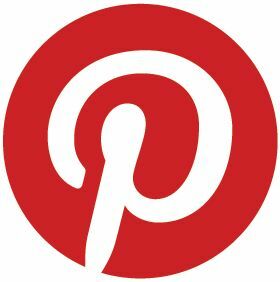 If you upload your creations to Splitcoast Stampers or any other online gallery, please use the keyword is ODBDSLC4 so that we may find your work easier. When creating your blog-posts, please include a link to the Shining The Light ODBD challenge . Dont forget to mark your calendars for the BIG ODBD ANNIVERSARY CELEBRATION DAYS coming up during March 13-17. There will be special reveals, lots of exciting events, challenges & prizes that you wont want to miss. For more INFO, check out the details on this previous post. Wow America! This is such a cool fold and so much decoration!!! Love your take on the challenge gf! This is gorgeous America!!! 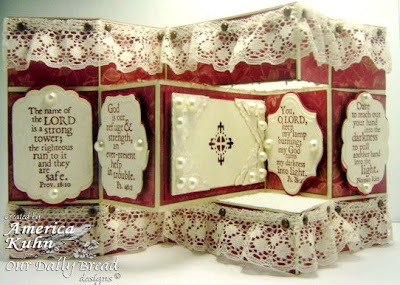 I just love the fold, the lace and your incredible use of the sentiments and spellbinders! You sure rocked the Think out of the Box challenge at ODBD this week!! Hope your son is feeling better!! America!!! this is one beautiful work of art!!! LOVE everything about it!! gorgeous! OMGoodness America this is amazing!!! 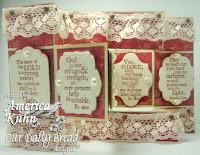 Love all the spellbinders with the scripture and verses! Just gorgeous!!! Oh America, you just outdid yourself on this one, it's just stunning workmanship, and you showcased these verses so beautifully! That is unbelievably luscious! It reminds me of a bedroom that could be found, let's say, in the White House or a Palace. I love all of that lace!!! I wish I had your lace supply! :) And, look at those scriptures. This is Amazing! Totally awesome trifold card, America. Wow just love all the lace and the sentiments too. Amazing work and thanks for sharing. STunning!! WOW!! This is truly amazing and gorgeous! Love all the folds and tha pretty lace!!! Wow is right, this is totally over the top awesome. I love those cards and this one tops them all. Just gorgeous!